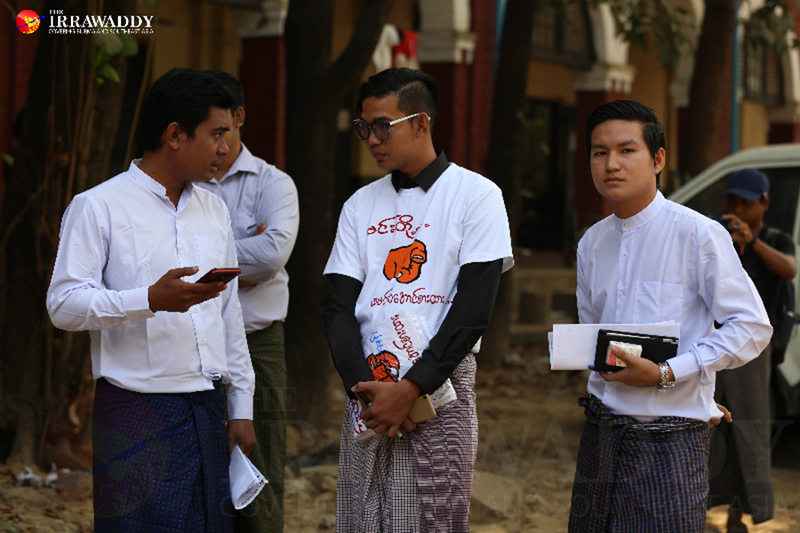 Mandalay – Lawyers organizations demanded action be taken against a group of people wearing T-shirts printed with the slogan “Eat well (before you die)” at the court hearing for slain lawyer U Ko Ni. Before the hearing in early February, a small group of nationalists appeared at the court in the T-shirts to show their support for four men accused of involvement in the murder of U Ko Ni. The phrase in Burmese is considered a threat to show one’s anger and to warn of impending revenge. The lawyers strongly condemned the act, which, they said, undermined the rule of law, the country’s judicial system and national stability. “This happened inside the court compound, not on the road or some other part of the city. Their action is an insult to the whole judicial system and a threat not only to the reporters, but to the lawyers and the judge,” said lawyer U Aung Soe, president of the Myanmar Lawyers Association for Media, during a press conference in Yangon on Sunday. A statement condemning the behavior of the nationalists and urging the government take action was signed by representatives of the Myanmar Lawyers Network, the Myanmar Lawyers Association, the Yangon Lawyers Association and the Myanmar Lawyers Association for Media. The defendants also allegedly shouted the phrase “Eat well (before you die)” at reporters and the plaintiff’s lawyers outside the court during a hearing in January. The phrase was used by the nationalists in an apparent show of support for the defendants Kyi Lin, Zeya Phyo, Aung Win Zaw and Aung Win Tun. “Since we are lawyers, we will continue to urge the government to act in a way that is in accordance with the law, to take legal action against those people, for they are intentionally threatening the stability of peace in the country,” said lawyer U Thein Than Oo, from the Myanmar Lawyers Network. The lawyers said they were also collecting signatures over the matter and would submit a petition demanding action be taken, to the chief minister of Yangon, the State Counsellor, the president and the commander in chief. “We think there is someone behind this trying to create unrest. So, we will send a letter to the government to push them to investigate and take action,” U Thein Than Oo said. “If the authorities fail to bring them to court, we will have to question them and do it on our own way, according to the law,” he added. In the meantime, the activist lawyer U Robert San Aung sent a letter to the offices of the President, State Counsellor, High Court and Ministry of Home Affairs to ask that the case be transferred from the current northern district court to a safer place. “Nobody can tell what will happen next, since these people have no respect for the court. A lawyer, a judge or a reporter may be their target one day,” said U Robert San Aung. “The authorities need to think about the safety and national stability, and to keep away these people who are threatening everyone and every institution,” he said.